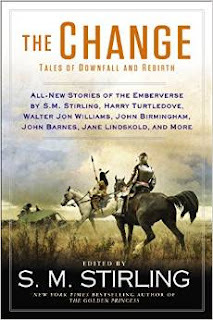 I have a story, "The Soul Remembers Uncouth Noises," in Steve Stirling's The Change: Tales of Downfall and Rebirth anthology. For those of you who don't know the genre publishing racket, successful franchises (and Steve's Emberverse is a very successful one) eventually lead to people other than the original author writing in that world. There are lots of reasons why other writers will do that, but the only one that matters for you-the-reader is that writing in someone else's world is fun. See? Knight in armor, Plains Nation warrior, wrecked helicopter. How much more fun could you want? Of course, all the fan fic folk out there could tell you that writing in someone else's world is fun. Some of the fanfictioneers write in other, established worlds as a bridge to creating their own, but most of them are well aware that they'd probably be doing themselves more good by creating their own right from the beginning. The truth is, at the bottom, writing in a world someone else has created is fun. That's the one reliably good reason to do it. For a longtime professional fiction writer, it's almost exactly as challenging as the writer wants it to be. The challenge I set myself was to take Steve up on one of his observations, that he'd figured that if there were a truly strange apocalypse, the survivors would also be the truly strange, and the postapocalyptic culture or cultures would be formed out of the weird fringes of our preapocalyptic world. For the past decade or so I've been dipping a toe in the increasingly-popular Young Adult waters, so I liked the idea of teenage characters surviving in a world where adults didn't. Furthermore, one way and another, I've become interested in twice-exceptional kids -- the category that could probably be more honestly called "weird geniuses," children and adolescents who are unquestionably gifted in one area with major difficulties in another: math or music prodigies with severe dyslexia, fourth graders who have twelfth-grade reading skills but tantrum like two year olds, and so forth. To me, anyway, one of the most interesting things about the twice exceptionals is not their difficulties, which tend to be obvious, but their ways of coping with them, which are wildly diverse and creative. Also, school-age twice exceptionals tend to form close friendships with each other. Part of this may be that there are increasing numbers of programs for them, so they meet there. A bigger part, I think, is that two kids who feel like aliens, though their gifts and problems are very different, are more likely to establish emotional rapport with each other than they are with more typical people with whom they share a gift or problem. Somehow or other being regarded as weird, and having trouble explaining yourself to the world, is a more foundational experience than merely being extremely good at some things and extremely poor at others. So I set my story, "The Soul Remembers Uncouth Noises," in the part of Denver where I live, on the day of the Change. (For those of you who haven't read Dies the Fire or any of the other Change/Emberverse books: the world of the books diverges from ours because at 6:15 pm Pacific Time, on March 17, 1998, all over the world, electricity, explosives, internal combustion engines, various other such high-energy-density systems stopped working abruptly). I put together three twice-exceptional ninth graders, gave them just enough luck to get started, and thought about what might happen to them and who they might turn out to be. Now, that's a very contemporary YA kind of story, the Understanding Difference story. And the frame story is actually pretty much a stock "cavalry western" (that is, back when westerns were a big part of pop literature, there were several subgenres named after who the main character would be: lawman westerns, cowboy westerns, gunslinger westerns, etc.). For various reasons I don't think Steve will be doing any contemporary Understanding Difference YA soon, but sure enough, there was plenty of room in the Emberverse for one, along with a cavalry western. And as some of you may know from my notes about the Daybreak books and the Jak Jinnaka books, I deeply love the idea of a fictional world big enough to tell any kind of story you like. And it was fun. Lots of it. That's what matters. You should go buy that book, and Dies the Fire if you haven't already yet, and lots more. Read it so that one of these days, when it's a miniseries, you can smugly tell all your friends how much better the book was.